Please read 'Terms' of business before ordering as by placing an order you agree to be bound by them. Buy This Book Online Securely Now! The Way of the Wolf continues the journey started with Words of a Wolf. This eclectic collection of poetry explores a Veteran's experience of living with Post Traumatic Stress Disorder and touches on the difficult subject of racism experienced in the Armed Forces and Metropolitan Police in the 1980s, as well as more positive and uplifting moments. It continues to provide an insight few will have seen to date. Click here for a Special Discount Offer to buy both titles! Please read 'Terms' before ordering! Click here. The aims of these Not For Profit companies are to raise awareness of PTSD, educate on Intellectual Property issues and promote creative arts as a coping mechanism for disability. The project is financed via selling prints and licensing images, as well as selling books. You will find images available for home and office decor, licensing for publications and website usage as well as photo art. There seem to be subjects and issues that people would rather see swept under the rug. I would count Veterans with PTSD and racism in the UK among them. This volume of poetry gives you a glimpse at the issues concerned. Fraught with emotion from a troubled soul but one with a powerful gift for the written word. An incredibly moving collection of poems. Some sombre, some angry but there are positive uplifting moments too. Trauma shatters basic assumptions about life and can leave individuals feeling disconnected and alone. Many veterans bottle-up their feelings and put on a coping mask so that those around have no idea what inner torment they are going through. In this moving collection of work, Wolf transforms feelings, sensations, questions and experiences around veterans’ PTSD into a narrative that others can connect with. He shines a light into areas that are often hidden or ignored and confronts and challenges the unacceptable. Wolf demonstrates how creative thinking and actions can assist recovery. The varied tempo of the work balances humour, love poetry and sharp observation with open and honest personal disclosure. This book tells you what goes on behind the armour and the challenges faced by PTSD sufferers. There's humour here too, and an honest look at how the condition impacts on daily lives. It's also a book of poetry about what it is to be open to experience, and a reminder that our similarities are greater than our differences. read by 'Wolf' describing his experiences and traumas with racial discrimination and Societies reluctance to deal with PTSD. Well done Wolf for having the courage to speak out and I look forward to your next book. After reading the writers first collection of poetry ' The Words of a Wolf' this second book was eagerly awaited. The wait was worth it though as I found this volume even more compelling and insprirational. It demonstrates how Wolf still constantly fights the war within himself but manages to soothe his wounds a little and cope with his PTSD through creative and recreational pursuits. He lies his soul bare as he painfully recalls experiences still raw from the time of serving his country, of hurtful racial discrimination and of an equally traumatic marriage break up which deprived him of his " cubs", to quote his own words. What I liked most about this book is that it gave me a feeling of tranquilty towards the end which made me smile. A transition from the harsh reality of the war memories to a more carefree and romantic side of his life, of his love for Salsa dancing and his connection to the wildlife in his garden which in turn help him to cope. . Thanks once again Wolf for sharing your emotions with us, I will be patiently waiting for book three! I was turned on to Villyat “Wolf” Sunkmanitu’s first book of poetry, “Words of a Wolf” by a friend. Since then I’ve had the pleasure of getting to know the writer through Facebook and his blog. Over the last two years I’ve appreciated and pondered upon the snippets he’s posted but anxiously awaited another book that I could gobble up quickly as I did the first one, set it down and think about it, and then pick it up again from time to time as I struggle with my own writing and my own PTSD. Wolf’s writing not only gives me insight into what a soldier is left with after he has done his duty to his country but what I really connected with was the PTSD he lives with every day. 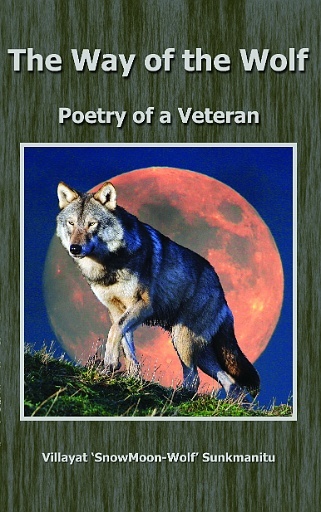 I’ve struggled with PTSD for a long time, just not for reasons of war and felt that no one really understood that; until I read Wolf’s poems and got to know the man. I found his second book “The Way of the Wolf” even more impactful than the first. I felt Wolf bared his soul in this book even more than in the first and at the same time his voice is even more sure as he speaks out upon what society does to those it no longer needs, how power corrupts, and how all of us from different creeds and colors need to speak out against racism and mistreatment of those of us that are mistreated because they aren’t what society considers to be the “norm”. The writing in the book veers from raw verses of emotion to expertly-crafted poems that tell a story and hopefully for those that connect with it a lesson and food for thought. I was especially moved by ‘Killing and Fighting’, ‘War is Theft’,’ Forgotten Heroes’,’ Fighting for Some Peace’,’ Lobo’, ‘Interpretation’, ‘False Hope’, and ‘Closing the Hole’. “The Way of the Wolf” moved me from anger to tears to hope and I found it to be an extremely intense and compelling journey. It’s a fantastic and unique piece of work and I look forward to Wolf’s next project.